2017 was definitely a whirlwind of events! It's hard to believe that the year is actually over and here we are in 2018. Time definitely does fly much faster when you're an "adult" but here's two theories about why we think so (I read from this from The Organised Mind). Firstly, as the perception of time is nonlinear and is based on the amount of time we’ve already lived, time seems to be moving faster for adults as we've already experienced many more years as compared to children. Thus, a year represents a shorter promotion of time in our lives as compared to that of say, a four year old. Another theory is that with age comes a slower reaction time, cognitive processing speed and metabolic speed, so the actual speed of neural transmission slows. This leaves the impression that the world is racing by, as relative to our slowed down thought processes. True, I'd say. Hope I didn't lose you there! If I did, it's cool. Let's move on to the actual fun stuff, or the main reason you're here, and that's my 2017 favourites. 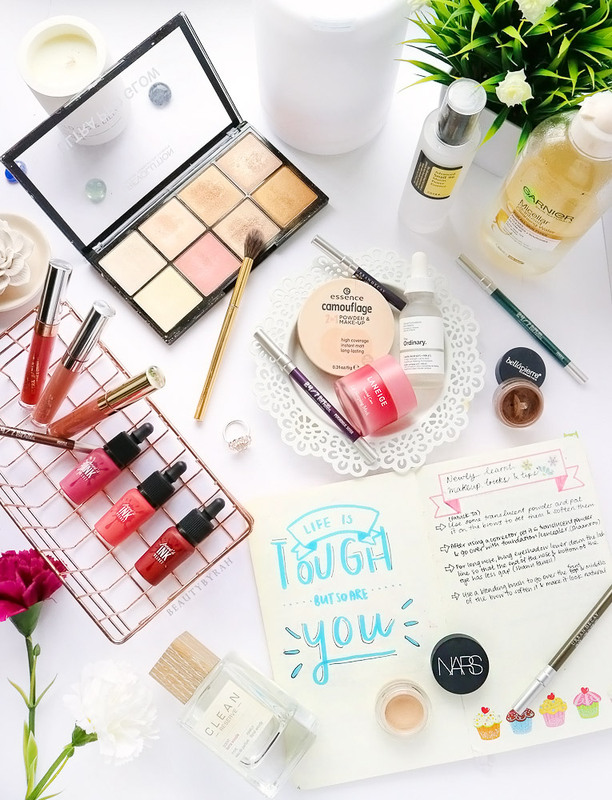 I broke it down into makeup, skincare and miscellaneous life bits for easier digestion! Oh, this concealer has to be the fastest, easier and fuss-free concealer that I have. Despite it being in a jar which isn't the most hygienic, this concealer is doing what I require it to do - which is conceal in a easy peasy way and last decently on the skin. I like to use my finger, dab it onto my undereye and leave it be for days where I want to look alive but can't be bothered with any other part of my makeup routine (brows and concealer are an absolute must for me on a daily basis, but other parts are more for frivolous play time). This concealer applies so creamy onto the skin and blends like a dream. Coverage is a full and it isn't drying on the skin. I don't set it on some days (so that if it fades or creases, I can simply top up more without risking patchiness by applying cream onto powder) and my undereyes still look smooth and creasing is to a minimal. This is top notch in my opinion and I throw it into my bag for touch ups throughout the day. I currently use the shade Custard. On days when eyeshadow is beyond my ability or time is of the essence, I would simply dust this gorgeous bronze pigment all over my lid and be done with it. This bronze pigment in Lava is truly, dare I say it, the prettiest bronze shade that I own in my collection. This pigment gives great intensity yet the formation is extremely blendable. When blended, this pigment looks like a warm toned brown in the crease while the eyelid oozes shimmery goodness. In certain lights, this pigment shifts more gold and in others, more brown. It's a shade that makes you look like you put in more effort in your eye makeup than you actually did. I really do love this and highly recommend you picking it up! For a clearer swatch, you can check out my post on Bella Pierre Makeup. The Ultra Satin Lip formula is one of my favourite formulas of all time. I find the Ultra Matte Lips from Colourpop to be overly drying on me, but the satin lips are a good mix of lasting power and moisture. 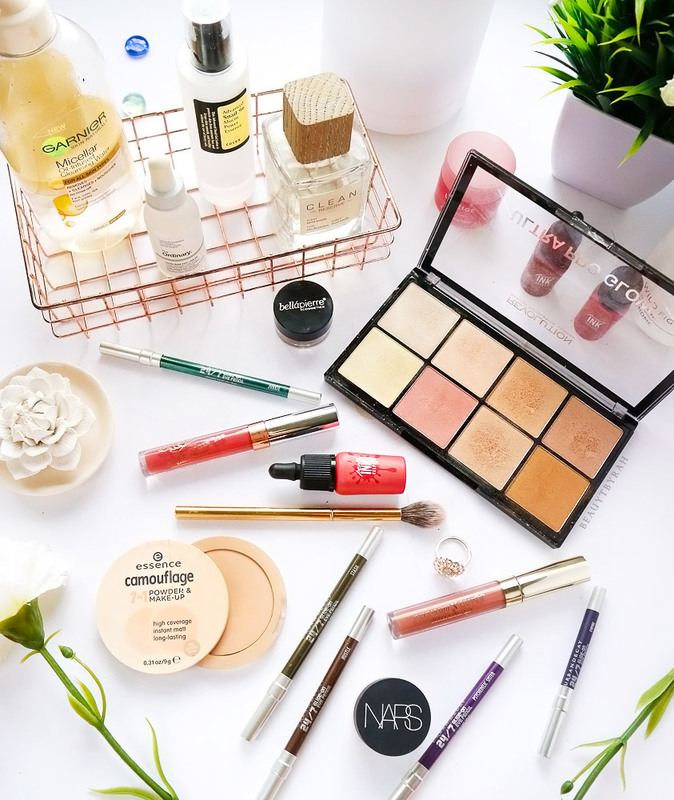 I would not say that these are moisturising on the lips, but my lips do not get dried out with these on throughout the day and my lip lines are not emphasised after application. I also do not get those pesky balls of dry skin that bundle up on the lips at the end of the day. These aren't completely transfer proof but I like how it fades nicely, giving me a wash of colour on the lips even at the end of the day. I usually pop these on in the mornings and I rarely ever touch up my lips during the day (I mean, I only deal with children and I don't see the need to impress them with a stunning pout). At night, I still have some colour on the lips without any pesky harsh lines and I do not look washed out. It's a win for lazy people like me. Featured here are three of my ultimate shade favourites, MRS, 951 and Aquarius. Ever since my trip to Seoul, lip tints have been invading my makeup collection ever since. Peri Pera does some of the better ones in my opinion, and my favourite from them would be the Ink Velvet Lip Tints, but it depends on what effect you want from your lip tint ultimately. 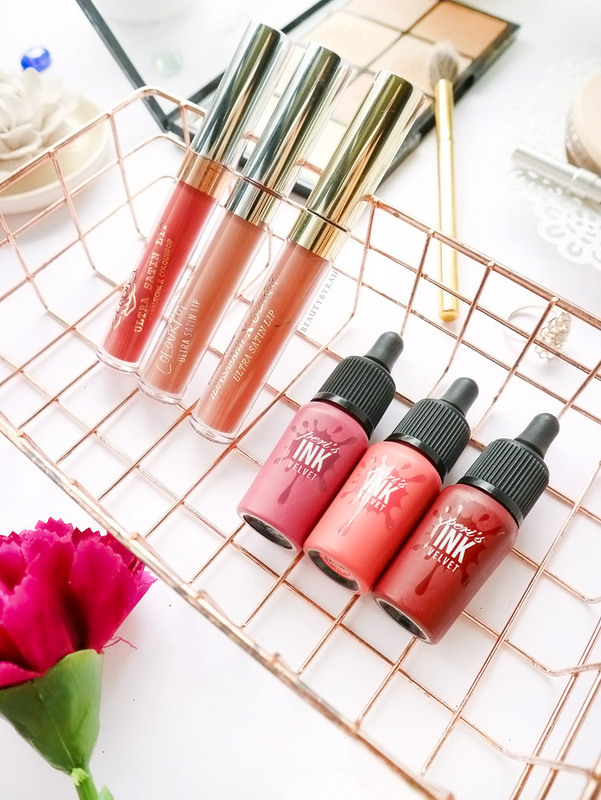 I absolutely adore the Velvet Lip Inks as these go on so creamy and pigmented that they resemble a liquid lipstick instead. After the top layer has disappeared from eating, drinking, snogging etc (I don't judge! ), it leaves a lovely tint on the lips as it fades so gracefully. It's one of those that I pop on in the mornings and not touch up at all throughout the day. I love these so much, I mentioned these in my March and June 2017 favourites. I've been off the radar when it comes to liquid liner this year and have been opting for pencil eyeliners to help define the eyelid instead. These Urban Decay 24/7 liners are truly one of the creamiest pencils that I've ever used and this is a huge plus for me as it glides on my eyelid with ease. I have quite a bit of excess skin on my lids and I absolutely hate it when eye pencils tug on them in order to deposit pigment. These from UD literally does what its name suggests and glide on without any tugging. These are creamy, pigmented and comes in a large range of shades. Some say that they smudge and fade on them, but luckily for me, I do not face any of those issues. If I had to pick my favourite shade (I've been rotating between about 8 shades this year), I'd go with Psychedelic Sister which is a gorgeous royal purple! Another one for those lazy days. In fact, I don't think I've worn liquid foundation at all for the past 4 months or so (with the exception of Christmas, because...it's Christmas)! This little powder foundation from Essence packs a punch and the finish is truly amazing. When applied all over the skin, it gives a radiant and slight dewy finish to the skin (pretty equivalent to applying a dewy primer and foundation before setting the face with a powder). My skin looks so healthy with this and coverage is definitely decent at a medium to a buildable medium-full without being cakey. The only downside is that oil controlling properties aren't the best and I do look pretty shiny during the day so an oily girl has gotta blot! But for those of you with dry skin, this might be heaven sent! I also mentioned this in my July Favourites. Best buy from London, period. This palette of 8 highlight shades are absolutely a steal and the formulation of these highlighters feel like high street or luxury even, and definitely not drug store (I got this for £10). If you're a fan of the glow without the glitter, this is truly the palette for you. The shade range is lovely, covering almost all from light to deep, cool to warm. One layer gives a glorious natural sheen to the skin and building up another will enable satellites to detect you from space. Get. Your. Hands. On. This. (if you can). 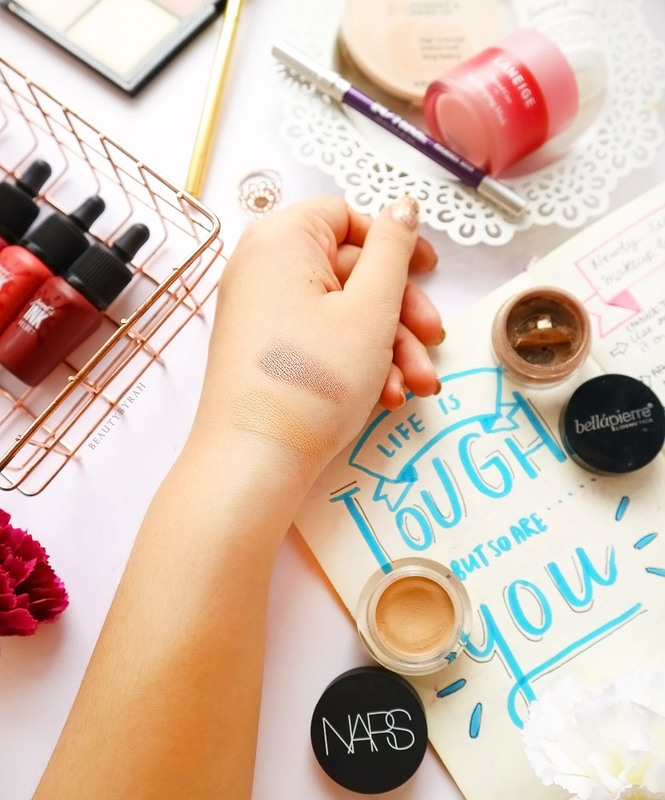 Swatches can be found in my July Favourites as well! This has to be my favourite highlighting brush of the year! I like the shape of it as it fits ever so perfectly on the tops of my cheekbones. As the brush isn't too big, it gives me a good amount of control over the placement of the highlighter powder onto the skin and this is extremely useful when using potent beamers (think Mary Lou, Becca and Jeffree Star). The bristles feel super soft on the skin and not at all scratchy! I also do think that the length of the bristles are perfect for diffusing the highlight so you don't get a thick strip of glow on the skin while keeping the diffusion to a minimal so that you don't end up looking like a disco ball unintentionally. 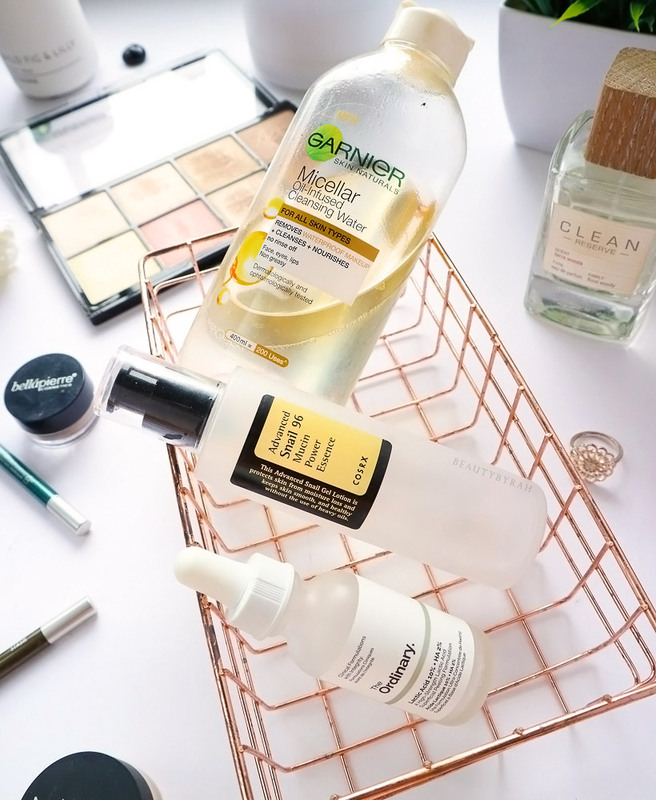 I have been using micellar water to remove my makeup for years now and this Garnier oil infused micellar water really inched its way to my ultimate favourite as it has the wonderful ability to remove waterproof mascara. I used to dread wearing waterproof mascara as removal was truly a pain and I would always lose some eyelashes in the process. With this, I can easily remove my waterproof mascara in less than a minute and I do not find the need to tug on my skin. Despite it containing oil, I also use this to remove my face makeup some times and it works great without being too oily and uncomfortable on the skin. Overall, a handy product to have if you're a fan of waterproof mascara! In the beginning of this year, my lips were extremely parched and I hated to wear any kind of liquid lipstick as the dry patches and lines were extremely visible. 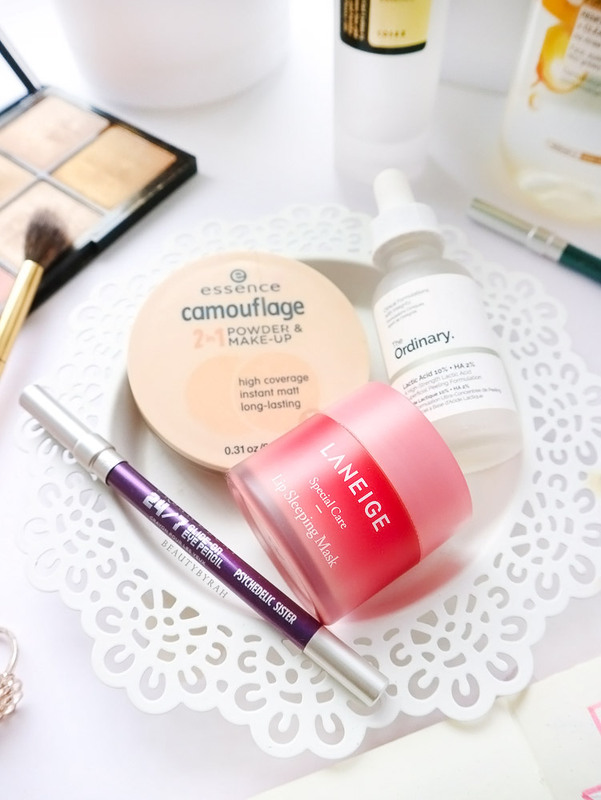 I decided to take the plunge to purchase this Lip Sleeping Mask from Laneige as I was pretty desperate (but not desperate enough to buy the one from Fresh cus that's expensive). I'm so glad that I did as this works so well in hydrating my lips! I'll put a thin layer before bed and when I wake up, my lips feel moisturised and they look plump. I've been sporting quite a few liquid lips recently too, as this lip sleeping mask makes all the difference in eliminating those pesky dry patches and helping my lips stay moisturised. I've been extremely into chemical exfoliation this year (I even mentioned it in my interview with Yahoo Lifestyle which you can check out here!) and this one from The Ordinary was a really affordable yet effective solution. This helps me in controlling those pesky little bumps that form under my skin ever so often and I do notice that my skin has been more radiant as compared to before using these. This one is a great option to start with if you're new to chemical exfoliants or have sensitive skin as lactic acid is gentler than the common salicylic and glycolic acids. 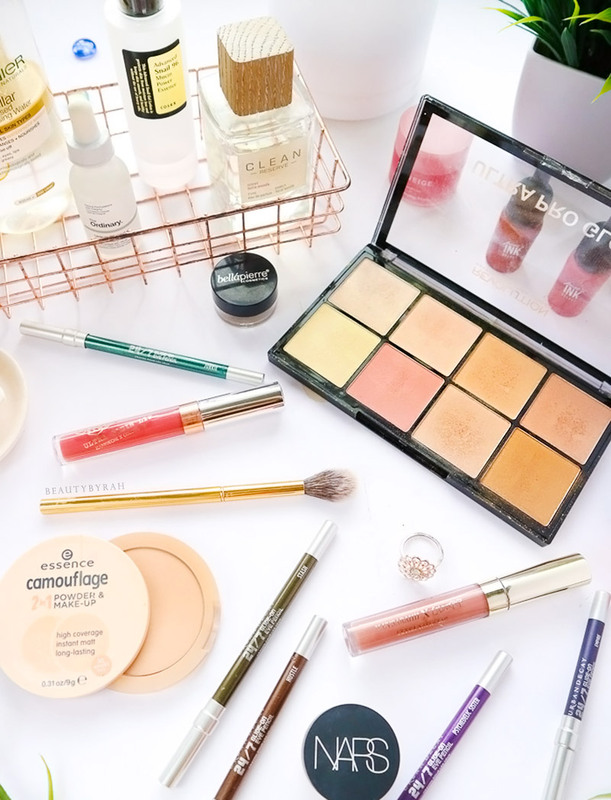 I also featured this is my August Favourites! This is also a form of chemical exfoliant and I'd say that this is stronger than the The Ordinary Lactic Acid 10% + HA 2% mentioned above. These come in the form of pads, which can be more convenient for some. Containing salicylic acid, I did find that these Stridex pads worked wonders for my skin in helping to control my acne (full review here). This was super affordable as well and you should check this out if you are looking for BHA chemical exfoliants. I bought this in Seoul in March and have been using it religious every night since and I'm still not done with my bottle! Snail skincare products are huge in the world of Korean beauty for the purposes of hydrating, healing and improving wrinkles. I can't honestly attest to the claims of healing and anti-aging but this definitely helped in hydrating my skin. I used to have really dehydrated skin which resulted in my skin producing tons of sebum in attempts to prevent any further moisture loss. After using this product for 9 months or so, I realised that my skin is less oily throughout the day and my skin rarely ever feels tight when I smile. Definitely a yes from me for its hydrating properties! This has changed the way I organise my life and I'm not exaggerating. I used to have lists everywhere as I would not have a place to store them all. With a bullet journal, I find myself using it for a myriad of purposes. Yes, I know I could have used a normal lined notebook a long time ago but there's something about the lined pages that kinda gives me anxiety. I would feel uncomfortable writing out of the lines and having different sections that are not spaced out evenly. I also felt so constrained and I can't seem to be creative with the pages. With the bullet journal (which basically has pages with light coloured dots on them), I find myself being free to utilise and design the pages according to my own wishes. The dots help in arrangement of section and drawing of lines, but doesn't constrict me in any way. I have sections such as my wish list, splurges, editorial calendar and of course, my monthly and weekly spreads which makes it so much easier to keep track with my to-dos and tackled tasks. I purchased my dotted notebook from Miniso but I can't seem to find it anymore! Regardless, there are numerous options out in the market and I will definitely keep using this method to help organise my day to day life. I mentioned this in my nightly self-care ritual post here and this is truly one of the best purchases of the year. I switch this on every night and I mix up my own concoction of essential oils depending on my mood (side note, I get my essential oils from iHerb as they are really affordable there!). This has helped tremendously in helping me wind down from the activities of the day and in my sleep quality. This is my favourite perfume, period. I own quite a few and I would always go back to this, especially on days I just want to feel good about myself. This perfume is a floral woody musk, containing top notes of geranium and jasmine sambac, middle note of coconut and base notes of musk tonka bean and vanilla. I generally do not ever go for musky perfumes as they always smell a little heavy and overpowering to me. This perfume however, does not smell that way to me at all. It does exude depth and sophistication, but not in a way that overpowers the senses. I rarely ever repurchase perfumes but this, I will. This can be found in Sephora stores, but I can't find it online! I've read quite a few books in 2017 and I have to say that this book from Pam Grout is my favourite. I really enjoy reading about the mind and the various perspectives on life and this book made an astounding difference in my life. Pam really knows how to talk about serious, life changing (to me) advice about how the way we think affects what actually happens in our lives in a light and humours manner which is so important as this stuff can get pretty deep. She touched on quantum physics and how our thoughts affect our vibration which in turn affects certain life outcomes. It can be quite difficult to grasp this idea (as I feel that people rarely ever talk about this) so I read the book thrice. If you enjoy reading about different perspectives or are into self enrichment, I highly recommend you picking this up! She also has a sequel E^3, which I also do enjoy. I always borrow mine from the library but I found it on Book Depository here. I feel like I just published my 2016 Favourites but here we are. Hope your 2018 was off to a great start! Side note, I am still listening to Christmas songs at night. This girl needs to move onnnn. What are some of your favourites for 2017?